Video clip synopsis – The construction of the Sydney Harbour Bridge was a massive investment for the NSW government. The cost was not only in monetary terms but also the destruction of significant areas of Sydney’s heritage and the loss of lives. Broadband MP4 bridge_bb.mp4 (4.7MB), suitable for iPods and computer downloads. The Bridge Workers is an excerpt from the film The Bridge (55 mins), the first episode of the three-part series entitled Constructing Australia, produced in 2007. Dr J. J. C. Bradfield, lead engineer in the NSW Department of Works changed the design of the bridge from a cantilever to single arched steel bridge, it is thought, after viewing New York’s Hell Gate Bridge. This change required massive amounts of steel, which Bradfield sourced in the smelters of Middlesborough in England which produced silicon steel. This was stronger than any previous type of steel and ensured that Bradfield committed to having British firms involved in the project. Australian workers were soon joined by stonemasons from Scotland and Italy, shipwrights from Belfast and furnace men from America. The building of the bridge was to be a hint of the Australia that would emerge after the Second World War. The construction of the bridge was a massive investment for the NSW government. It was built at the time of a transport revolution. Henry Ford’s assembly line system of production meant cheaper prices for private automobiles. Dr Bradfield insisted that the bridge be built for a future that included cars streaming over the harbour. He also insisted that it be part of an integrated transport system that linked with the city circle underground railway being built at the same time. The agreed price of the bridge was 4,217,721 pounds 11 shillings and 10 pence, an astronomical sum for the times, and one that ensured that NSW would have to borrow heavily to finance the project. The payoff was to be the heaviest bridge in the world, a steel colossus that would bring the country international attention, link the two halves of the city, provide a massive employment boost and enable the city and its workers to function more efficiently. An added cost was the destruction of significant areas of Sydney’s heritage. The approaches to the bridge required the demolition of houses, churches and colonial era buildings in The Rocks area of Sydney were carried out with little or no compensation given. People were left homeless and even a social progressive like Premier Jack Lang regarded the resumption of properties as a necessary price to pay for progress. Sixteen lives were lost during the construction of the bridge. Workers were required to work without harnesses or restraints up to 90 metres above the water. 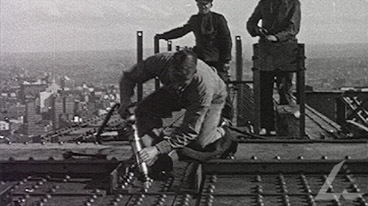 Occupational health and safety was an unknown concept, and the steel was frequently slippery. When the bridge opened the toll was sixpence for a car and threepence for a horse and rider. The toll was paid to recoup the cost of building the bridge. It was finally paid off and since then the toll has paid for maintenance. Research the lives of Jack Lang and Dr J. J. C. Bradfield. Use that information to write an entry for each man in an encyclopaedia of Australian history. In groups, organise a design competition for a transport plan for Sydney in the year 2050 that incorporates the bridge.What is occupational health and safety? How would the building of the bridge have changed if there was government legislation covering it in the 1920s? Debate the argument that the destruction of The Rocks was too high a price to pay for the bridge. Compare the destruction of The Rocks in the 1920s with the Green Ban activities of Jack Mundey and the Builders Labourers Federation in the same area in the 1970s. Draw up lists of similarities and differences. Can you create a stronger case for one approach over the other? Create an interview with one of the following figures at the opening of the bridge on 19 March 1932. Devise questions that will give the interviewee the opportunity to speak about the pride they feel in the achievement. Research is the best way to make sure your interview appears authentic. Choose from: Jack Lang; Dr Bradfield; Captain de Groot; a worker who helped build the bridge; someone who worked in Sydney but lived north, and had previously had to travel to work by ferry; a school child who had walked across the bridge in the days before its official opening; a visitor from interstate; a visitor from overseas.